Released in late 2018, Preparing for the Future of Transportation: Automated Vehicle 3.0 (AV 3.0) serves as a companion piece to Automated Driving Systems 2.0: A Vision for Safety (AV 2.0). 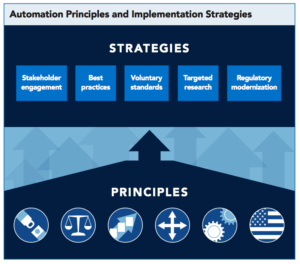 AV 3.0 establishes six “automation principles,” along with five corresponding implementation strategies, that are reflected throughout the report and more broadly intended to shape federal policy. AV 3.0 builds on 2.0 with three overall goals. AV 2.0 offered 12 priority safety design elements for consideration by the industry before deployment of Automated Driving Systems (ADS), specifically used to describe SAE Levels 3 through 5. These elements, along with encouragements for ADS developers to adopt voluntary safety self-assessments and technical standards, are affirmed in AV 3.0. The new report also provides a set of best practices for state and local governments to consider during AV testing, along with an illustrative framework identifying necessary safety considerations between various stages of testing and full deployment. AV 3.0 affirms the National Highway Traffic Safety Administration’s (NHTSA) regulatory authority establishing design standards regarding vehicle safety, and states that interpretation of statute referring to “drivers” and “operators” will not necessarily exclude ADS. Additionally, AV 3.0 AV rescinds recognition of the ten Automated Vehicle Proving Grounds announced in early 2017 and commits that FTA technical assistance to transit agencies testing AV buses will take a tailored approach to safety management. AV 3.0 further defines the federal government’s intended role in AV research and announces opportunities for collaboration and feedback on a number of upcoming initiatives, including the streamlining of NHTSA’s procedure for processing legal exceptions; updates to the 2009 Manual on Uniform Traffic Control Devices; and the Federal Motor Carrier Safety Administration’s (FMCSA) rulemaking regarding commercial vehicles using ADS. The new report also announces a future, multi-Cabinet study on the potential workplace and economic impacts of ADS.